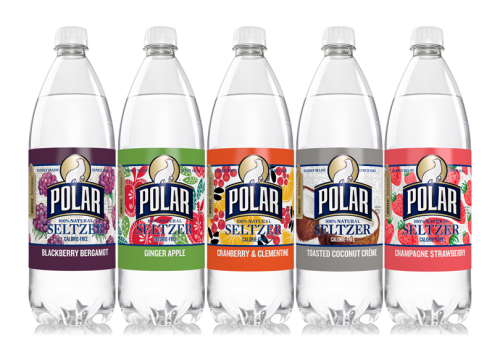 Polar Seltzer Limited Edition 2014 : NEW! / Polar Seltzer will never stop over-sharing their love for the favorite local berry – cranberries. But this winter the lovely tart fruit is dressed up with the season’s best citrus for a sophisticated update on very classic New England combination. / Earthy richness of blackberries is gilded with the citrus notes of bergamot (you’ll recognize it from its role in Earl Grey tea). An opulent combination of aroma and flavor, this starry Polar Seltzer is perfectly for winter hydration or paired with winter comfort foods. / Apples are everywhere in New England, and now they’ll be available with an effervescent modern attitude. The fieriness of ginger adds an exotic flare to the wholesome crisp taste of winter apples. / Folks are in the mood for food during fall and winter, and to that Polar Seltzer says “Let’s Toast!” Perfect for the entire family to enjoy, celebrate the upcoming “foodie” season with guiltless Strawberry Champagne Polar Seltzer. / Sort of like a trompe l’oeil dessert, this sparkling sensation conjures up the yumminess of rich coconut and cream without any of the naughtiness of calories, sodium or sweeteners. And yes, like all Polar Seltzer, Toasted Coconut Créme is 100% natural and calorie-free. Hope you tasting all five our seasonal sparklers. Be sure to post your comments on the Polar Seltzer facebook page or share any beverage recipes you have created. Winter has never tasted this good! Impossibly Good: Unicorn Kisses is Back! Mayday, Mayday…This is a Seltzer Alert.